Your annual membership contribution may be submitted using the PayPal button below. For your convenience, we also offer an option to set your annual contribution to a subscription which is automatically debited each year until you elect to discontinue your support of the timebank. Through membership in the Kola Nut Collaborative people: create and strengthen community bonds, create economic freedom by providing an alternative means to get needs and desires met, and encourage creativity in redefining self-sufficiency, interdependence and valuation of time. The Kola Nut Collaborative introduces a paradigm where members reflect on the available resources in their lives moving from a perception of scarcity and lack to abundance and wholeness. 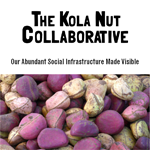 The Kola Nut Collaborative is an initiative of Kola Community Solutions LLC.